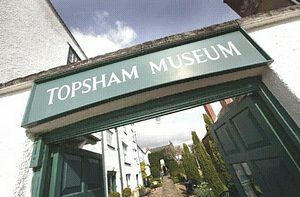 Topsham Museum is housed in one of a group of late 17th Century Buildings overlooking the Exe Estuary. As well as the furnished period rooms of the house, visitors can also enjoy the displays of local history with a maritime background. The Riverside Gallery houses the Cygnet and other examples of the maritme history of Topsham. There is a display of the wildlife on the Exe which has been developed with the RSPB. Another attraction is the Vivien Leigh Room where the nightdress worn in 'Gone with the Wind' is on display. Topsham Museum offers a surprising variety of displays and the 2011 Exhibition celebrates 150 years of the Exeter to Exmouth Railway'. The supplementary exhibitions start off with 'fabrics and Photos' An exhibition of wallhangings and photos by local experts. Children are always welcome and a quiz and a trail provide an intersting afternoon for our younger visitors.